Not so long ago, I appeared to have finished all of my last hoard of Puzzle Master deliveries. Very quickly suffering from withdrawal symptoms, I decided that it was definitely time for some more - and spent a very happy half hour or so rampaging through their emporium of goodies for more toys to play with and of course even more to write about for you. I really do like to have a few mass-produced puzzles to write about to ensure that I am not only writing about things that are unobtainable for many of you. What I try to do is make an occasional large order because Canadian post is sooooo expensive that I try to get the package weight to the point where it is worthwhile buying and before it doesn't get really exorbitant! So during the week, I received another big box of new goodies to keep me occupied. One of the first that I grabbed to try was the Cast Cylinder from Hanayama - this was released in August 2013 and has been raved about by friends of mine and by other bloggers. It just took me a while to get around to adding it to my collection. However, the wait was definitely worth it - it is a really clever puzzle with some very interesting challenges. As usual, the packaging is delightful and everything nicely held in place - no chance of breakages or it solving itself in the box as has happened to me with other company's puzzles. The instructions on the box are simply to dismantle it and put it back together again. They are so confidant in the difficulty that they actually show the pieces on the box. Rated as a level 4/6 by Hanayama and 8 (Demanding) on the 5-10 point scale by Puzzle Master, it should be a nice challenge to most puzzlers. Having been designed by the very prolific Vesa Timonen who had designed the Cast Donuts (one of my absolute favourites), I had high hopes for this one. It has been reviewed before by Jerry on his blog here, and by Gabriel here (both of them failed to manage the puzzle reassembly without help). The customer reviews on the product page have been very positive. No solution is given with it but if you need one then it can be downloaded from here although, to be honest, I'm not sure how much help it will be for the reassembly. So whilst idly fiddling and not even really looking at it properly - I suddenly felt something new! Looking down, I discovered I had managed to move another piece and this opened up a few more possibilities. Very interesting. At that point, I thought I should reset it and wait until I was between cases. Duly done, I finished the case and whilst waiting for the next, I played again. Unfortunately, I couldn't repeat it initially and had to put it away again when my next happy victim arrived. During my next little break I got a good 10 minutes to play and suddenly found a sequence of moves which ended with a clang! Thank goodness I wasn't at home - Mrs S hates the clang! So much so that I feel pain even at the thought of it! A piece had fallen out and I had only a vague idea how. The last 2 pieces were still well locked in but had lots of movement possible. Peering inside revealed how it worked and I got the final pieces out and proudly showed my colleague! He thinks I'm either a savant or a very sad man! Here's what the pieces look like - I actually think that even seeing what they look like barely helps at all. I quickly looked at the pieces, noticed a few very interesting features and was able to work out the mechanism pretty quickly - or so I thought! I decided not to reassemble straight away - I was going to take my photos first. My anaesthetic assistant couldn't resist - she, like many girls, was enticed by the shiny shiny and decided she would put it together herself - I felt safe enough that she wouldn't manage it. For quite a bit of the rest of the afternoon there was a continual stream of muttering profanities and clanging noises! Despite trying for nearly 2 hours she never managed to assemble it! I took it home and had a little play in the late afternoon before going out to some friends for dinner and singularly failed! Hmmm! I was sure I had understood the process but nothing would allow me to get that third piece inside. Damn!! This morning I tried again and failed! A short period of blasphemy produced a rather surprised Mrs S who was also attracted to the shiny shiny! She took it off me saying that it can't be that difficult and spent 15 minutes muttering to herself whilst failing to assemble it. After about 2 hours, I got it back together again and am sure that I had not used the reverse process to disassemble it. Phew! 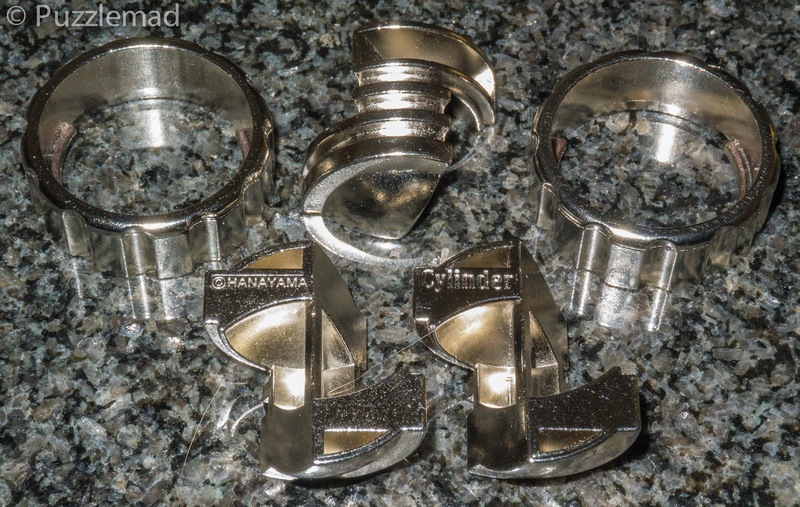 I think the disassembly should be rated as a level 3-4 on Hanayama's scale but the reassembly is actually a good bit harder (maybe even a level 5). According to Jerry there are many people who have struggled with the reassembly. I have done this puzzle 8 or 9 times now and even now still struggle with it! I downloaded the solution which didn't really help me with putting it back together! Maybe it will be better for you. 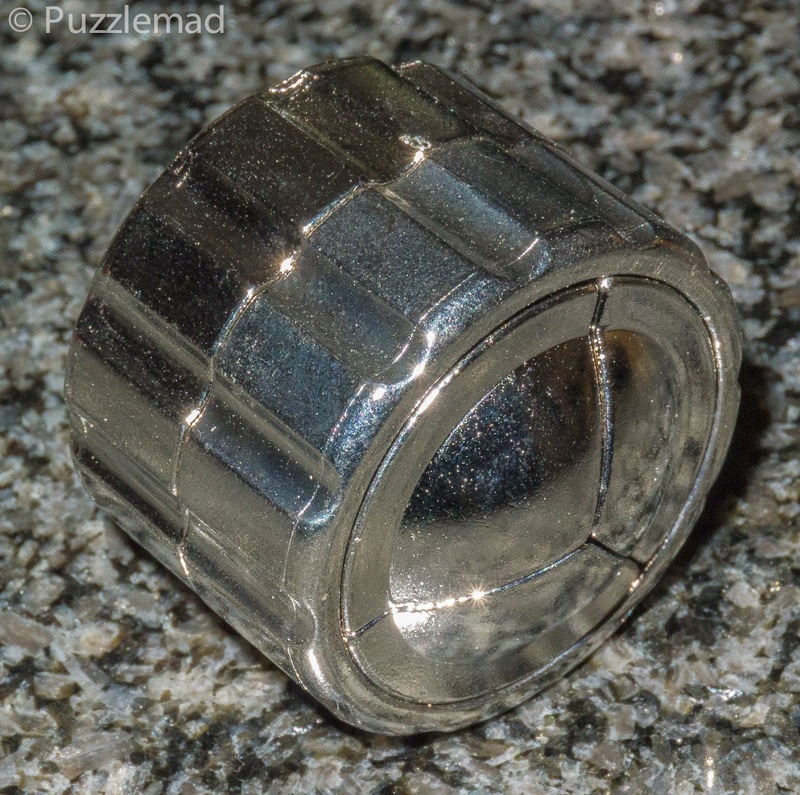 I really like this puzzle - it is quite a bit harder than the ring would suggest and is very shiny - if it attracts the present Mrs S to playing then it has got to be enticing! I plan on carrying it with me for a while yet - firstly until I actually understand it and then to torture my colleagues. Good luck with it. You'll get there eventually. Just got this puzzle, and man am I pissed at how stupid I am. I was not able to reasemble after hours of trying. I get how it works, but just cannot get it to close. Will have to try later, vent over. It is a really great puzzle and not at all intuitive to reassemble. A solution is available if you really need it. You can download it from PuzzleMaster if you are really really desperate. I have managed to solve it the next day. Had to sleep on it, but man am I going to force everyone who disassembles it to put back together. Well done! You're a tough puzzle taskmaster if you do that to everyone!